A TV crime show I saw recently centered on the ability of forensic scientists to identify a plastic bag as coming from a particular roll: it’s all down to the striations, apparently. This development isn’t fiction, though: researchers at the University of Buffalo have figured out how to identify the individual 3D printer that produced a particular print. The development, called PrinTracker, uses unique differences in the way a printer lays down print material to identify a printer with a claimed 94 percent accuracy. The old saying is if your data isn’t backed up at least twice, it’s not backed up at all. For those not wise enough to heed this adage, there are a number of options available to you if you wish your data to be recovered. Assuming the drive itself is just corrupted somehow (maybe a malicious attack, maybe a user error) and not damaged beyond physical repair, the first step is to connect the drive to another computer. If that fails, it might be time to break out the computer forensics skills. [Luis]’s guide is focused on Linux-specific drives and recovery tools, so this isn’t necessarily a general-purpose how-to. That being said, there is a lot of information in this guide such as how to mount the target drive’s partitions, how to set up various timelines, and which of the Linux system’s logs are important for the forensic analysis. This specific example in the guide also goes into detail about noticing which of the recent files had been accessed, what they might have done, and different approaches to piecing the mystery of this corrupted drive together. [Luis] points out that the world of Linux forensics is much different from that of Windows, but for anyone looking to get started he suggests starting with a clean Linux install and going from there. There are many other avenues of digital forensics, as well; the field has as many avenues of exploration as there are different types of computers. It is interesting to see the wide coverage of a police investigation looking to harvest data from the Amazon Echo, the always-listening home automation device you may know as Alexa. A murder investigation has led them to issue Amazon a warrant to fork over any recordings made during the time of a crime, and Amazon has so far refused. Not too long ago, this is the sort of news would have been discussed on Hackaday but the rest of my family would have never heard about it. Now we just need to get everyone to think one step beyond this and we’ll be getting somewhere. What isn’t being discussed here is more of concern to me. How many of you have a piece of tape over your webcam right now? Why did you do that? It’s because we know there are compromised systems that allow attackers to turn on the camera remotely. Don’t we have to assume that this will eventually happen with the Echo as well? Police warrants likely to affect far less users than account breaches like the massive ones we’ve seen with password data. All of the major voice activated technologies assert that their products are only listening for the trigger words. In this case, police aren’t just looking for a recording of someone saying “Alexa, help I’m being attacked by…” but for any question to Alexa that would put the suspect at the scene of the crime at a specific time. Put yourself in the mind of a black hat. If you could design malware to trigger on the word “Visa” you can probably catch a user giving their credit card number over the phone. This is, of course, a big step beyond the data already stored from normal use of the system. It’s not surprising that Amazon would be served a warrant for this data. You would expect phone records (although not recordings of the calls) to be reviewed in any murder case. Already disclosed in this case is that a smart water meter from the home reported a rather large water usage during the time of the murder — a piece of evidence that may be used to indicate a crime scene clean-up effort. What’s newsworthy here is that people who don’t normally think about device security are now wondering what their voice-controlled tech actually hears them say. And this is a step in the right direction. There’s a very effective way of lifting dusty fingerprints from the field, or in a lab. It’s called an Electrostatic Dust Print Lifter — but as you can imagine, it is rather expensive from a forensic supply store. [Bradley VanZee] — from the Iowa Division for International Association for Identification — realized how simple a tool it was, and made his own for just over $50. But first, how does it work? Electrostatic print lifting is a non-destructive process where you develop an electrostatic field on a sheet of “lifting film” which attracts the dust particles to stick to the film. It’s capable of recovering impressions from both porous and non-porous surfaces — even ones not visible to the naked eye. Commercial versions of the tool cost upwards of $600-$800 + lift film. The first hack they realized is that instead of using proprietary lift film, it is just as effective to use car window tint instead! The second hack is even more clever — using a 80,000V tazor, some electrical leads, and some tinfoil you can create your own version of the tool. 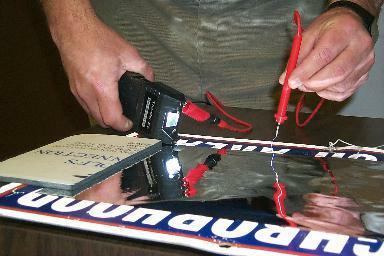 The aluminum foil acts as a ground, and the object you are inspecting is sandwiched between it and the lifting film. Holding the tazor with one electrode to the foil, you can trace the film using the other electrode at a distance, which induces an electrostatic charge in the film, attracting and capturing the dusty fingerprints. Allow the static to discharge, and store the film in a safe place to be digitized later! Now obviously this is only really effective for flat objects, but it’s still a brilliant hack — especially to save your budget!